The most significant event in Palmer’s early life occurred in 1824 when the sensitive 19-year-old was introduced to William Blake, then in his 67th year. Palmer immediately recognised a kindred spirit, whose art spoke to Palmer’s own sense of the mysterious divinity of creation. Blake became the dominating inspiration for Palmer and his idealistic brotherhood of young artists, the ‘Ancients’, who lived by the motto ‘poetry and sentiment’. … visions of little dells, and nooks, and corners of Paradise; models of the exquisitest pitch of intense poetry. I thought of their light and shade, and looking upon them I found no word to describe it … There is in all such a mystic and dreamy glimmer as penetrates and kindles the inmost soul, and gives complete and unreserved delight, unlike the gaudy daylight of this world. Despite the powerful spell Blake cast over Palmer, the ironies and perversities of Blake’s art were fundamentally alien to him. Palmer’s imagery stressed an essentially benevolent view of humanity and nature; a response to the landscape invariably exhilarating and inspirational. Blake was a bleaker, less innocent artist than the socially reactionary and religiously orthodox Palmer could admit. By the time Palmer turned to etching in 1850, at the age of 45, the demands of painting saleable pictures had diluted the intensity of religious and poetic insight that had once distinguished his work. 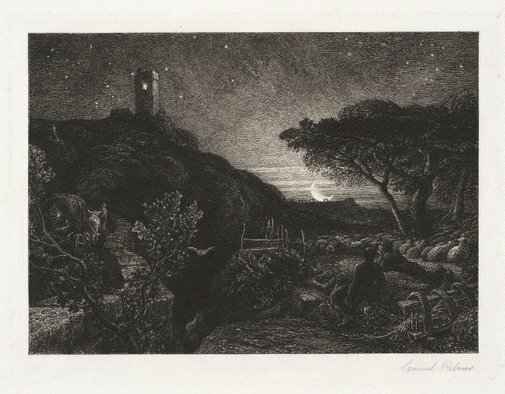 Palmer’s adoption of etching was thus a self-conscious effort to rekindle the heightened perception of his early years, when he knew Blake and worked in idyllic seclusion with the Ancients at the village of Shoreham in Kent – the ‘valley of vision’ as he called it. The 13 etchings completed before his death in 1881 stand as a reaffirmation of Palmer’s unique imaginative powers, and can be seen as the direct progeny of the great Shoreham drawings of the 1820s and early 1830s. Palmer elaborated his plates with painstaking care. Extensive use of stopping out and repeat biting helped achieve the dense hatchings and highly wrought surfaces that characterise his prints. ‘The charm of etching’, he wrote with evident delight in 1876, ‘is the glimmering through of the white paper even in the shadows; so that almost everything either sparkles, or suggests sparkle … those thousand little luminous eyes which peer through a finished linear etching’. Palmer revered the great poet from an early age, and admitted that the two items he carried with him in his pocket at all times were a sketchbook and a ‘little bound Milton’. We must reach poetic loneliness – not the loneliness of the desert, but a secluded spot in a genial, pastoral country, enriched also by antique relics, such as those so-called Druidic stones. The constellation may help to indicate that the building is nothing else but the tower of Il Penseroso. Shepherds may gaze, not at the sky, but at the light given forth by My lamp at midnight hour. The tower depicted in the etching stands on Leith Hill in Surrey. It was full of personal and tragic associations for Palmer since it was close to where his eldest son, Thomas More, died in 1861. The tower was also visible from the studio at Palmer’s house at Mead Vale, where he had relocated with his family the following year. The watercolour is now in the Yale Center for British Art, New Haven. It differs from the etching most notably in the time of day depicted, which is sunset. A second, smaller watercolour, which corresponds more closely to the etching and was probably made after it, is in the Huntington Library, San Marino. Signed l.r., pencil "Samuel Palmer". Not dated. Peter Raissis, Look , 'Early European works on paper', pg.20-23, Sydney, Aug 2014, p 22. Prints & drawings Europe 1500-1900 , Sydney, 2014, col illus pp 156-57, p 158, col illus p 159.